The use of soft braces to treat scoliosis has been described by Fischer as early as 1876. With the help of elastic straps, as the authors suggested, a corrective movement for individual curve patterns should be maintained in order to inhibit curve progression. Today this concept has been revived besides soft 3 point pressure systems. Some shortcomings have been revealed in literature in comparison with hard braces, however the concept of improving quality of life of a patient while under brace treatment should furtherly be considered as valuable. Purpose of this review is to gather the body of evidence existent for the use of soft braces and to present recent developments. A review of literature as available on Pub Med was performed using the key words ‘scoliosis’ and ‘soft brace’ at first. The search was expanded using ‘scoliosis’ and the known trademarks (1) ‘scoliosis’ and ‘SpineCor’, (2) ‘scoliosis’ and ‘TriaC’, (3) ‘scoliosis’ and ‘St. Etienne brace’, (4) ‘scoliosis’ and ‘Olympe’. The papers considered for inclusion were new technical descriptions, preliminary results, cohort studies and controlled studies. When searching for the terms ‘scoliosis’ and ‘SpineCor’: 20 papers have been found, most of them investigating a soft brace, for ‘scoliosis’ and ‘TriaC’: 7 papers displayed, for ‘scoliosis’ and ‘St. Etienne brace’: one paper displayed but not meeting the topic and for ‘scoliosis’ and ‘Olympe’: No paper displayed. Four papers found on the SpineCor™ were of prospective controlled or prospective randomized design. These papers partly presented contradictory results. 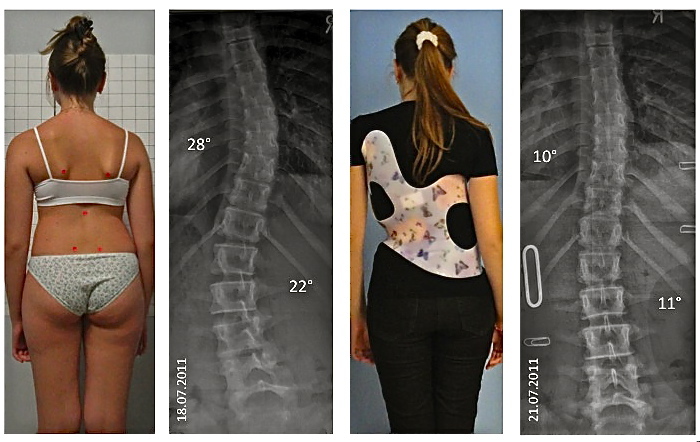 Two papers were on soft Boston braces used in patients with neuromuscular scoliosis. There is a small but consistent body of evidence for the use of soft braces in the treatment of scoliosis. Contradictory results have been published for samples treated during the pubertal growth spurt. In a biomechanical analysis the reason for the lack of effectiveness during this period has been elaborated. Improved materials and the implementation of corrective movements respecting also the sagittal correction of the scoliotic spine will hopefully contribute to an improvement of the results achievable. The treatment of scoliosis using soft braces is supported by some papers providing a small body of evidence. During the growth spurt the use of soft braces is discussed contradictory. There is insufficient evidence to draw definite conclusions about effectiveness and safety of the intervention. The use of soft braces to treat scoliosis has first been described by Fischer (1876, cited by Schanz, see also Additional file1). With the help of elastic straps, as the authors suggested, a corrective movement for individual curve patterns should be maintained in order to inhibit curve progression (Figure1). Left the soft brace as described by Fischer 1876 and a soft brace of current standard as distributed today (middle and right). Unfortunately no picture from the rear exists for the Fischer brace, however the adjustment of the corrective ribbon from the front seems rather identical. (With kind permission by Pflaum, Munich). However soft braces have been forgotten for long: Hard braces have been proposed by Wullstein (1902) not long after the first publications on soft braces. Later the Milwaukee brace has been proposed, the Chêneau brace[4, 5] and the Boston brace, all of them hard braces with reasonable impact on the quality of life of the patients treated. While the Milwaukee brace was less effective, early outcome studies have described the Chêneau brace[4, 5] and the Boston brace as effective in the prevention of curve progression during growth. Prospective controlled multicenter and long-term studies have shown the Boston brace to be effective, but there were also outcome studies on the Chêneau brace clearly demonstrating that in-brace correction and compliance are crucial to the outcome of brace treatment. During the late 80’es and early 90’es in France soft braces with the 3-point pressure approach have been described like the St. Etienne brace and the Olympe[10, 11], but these have not been investigated furtherly. During the 90’es soft brace treatment was re-developed. 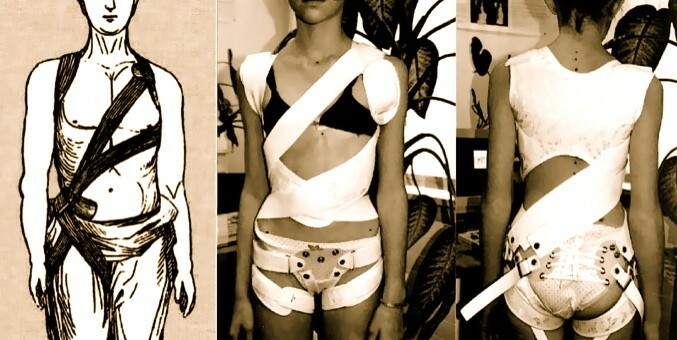 The soft brace as presented by Coillard[12–14], comparable to the brace described by Schanz, was indroduced another time and the first results were published in 2003. A cohort of patients from 4 – 14 years of age have been treated successfully with the help of this brace. Later on more positive results have been published. However, as Coillard and Rivard have pointed out the group of patients at risk for progression (first signs of maturation, premenarchial) showed to have the least positive effects. In two independend prospective controlled studies the soft brace as presented by Coillard[12–14] has been shown to be less effective than hard braces[15, 16]. This fact has been analyzed and the unsatisfactorily correction of the sagittal profile in the soft brace as presented by Coillard[12–14] has been accused to be the reason for this. As a matter of fact a relordosation of the lumbar spine is not induced when using the soft brace as presented by Coillard[12–14]. Therefore the compressive forces generated in this application may destabilize the spine, while a restoration of the sagittal profile can stabilize and even correct scoliosis as has been described by van Loon in 2008. Other reviews, experimental studies or case series seem to support these findings[19–26]. As it seems, to improve the results of soft braces during the high risk phase of the pubertal growth spurt, the sagittal plane seems to be important to focus on in order to improve the results of treatment also in the population at risk for progression (Figure2). 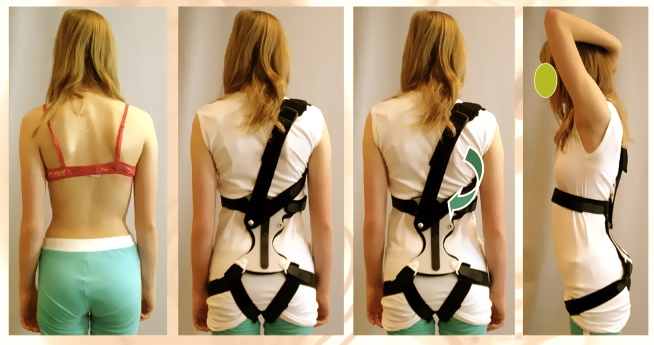 Universal Spine Orthosis as developed 2007. This brace uses shifting of shoulder and pelvic girdle against each other as well as a restoration of the sagittal profile (right). (With kind permission by Pflaum, Munich). Purpose of this development was to improve the corrective movements in frontal plane as have been described[12–14] and add a considerable correction of the sagittal plane in order to stabilize the spine while it is compressed by the elastic straps, wrapped around the entire trunk. However, some shortcomings[15–17] have been revealed in literature in comparison with hard braces, however the concept of improving quality of life of a patient while under brace treatment should furtherly be considered as valuable. Purpose of this review is to gather the body of evidence existent for the use of soft braces and to present recent developments. A review of literature as available on Pub Med was performed (January 31st. 2012) using the key words ‘scoliosis’ and ‘soft brace’ at first. The search was expanded using ‘scoliosis’ and the known trademarks (1) ‘scoliosis’ and ‘SpineCor’, (2) ‘scoliosis’ and ‘TriaC’, (3) ‘scoliosis’ and ‘St. Etienne brace’, (4) ‘scoliosis’ and ‘Olympe’. A case report is presented to demonstrate the in-brace correction achievable in a recent development. ‘scoliosis’ and ‘SpineCor’: 20 papers have been found, most of them investigating a soft brace. ‘scoliosis’ and ‘TriaC’: 7 papers displayed. ‘scoliosis’ and ‘Olympe’: No paper displayed. The papers considered for inclusion were new technical descriptions, preliminary results, cohort studies and controlled studies[12–16, 27–44]. Four papers found on the SpineCor™ were of prospective controlled or prospective randomized design[15, 16, 39, 42]. 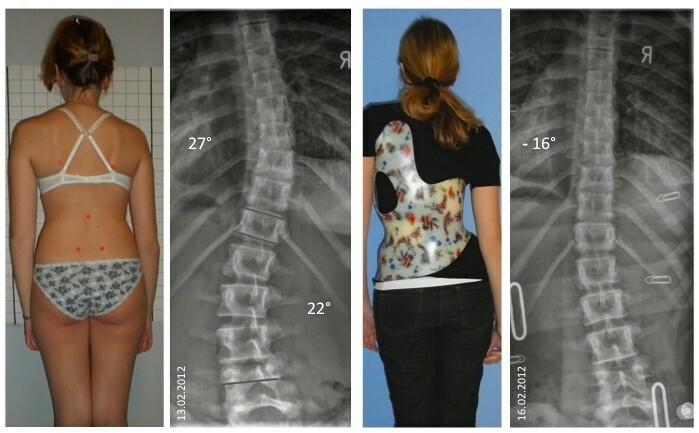 Two papers were on soft Boston braces used in patients with neuromuscular scoliosis[45, 46]. The idea of using soft braces and reducing the impact braces have on the patients is appreciated. However as there seem to be certain shortcomings, these should be ruled out to increase patients’ safety and enlarge the range of indications. The corrective movement in frontal plane as described by Fischer and later by Coillard[12–14] should be preserved while lumbar lordosis should be augmented with the help of a newly designed soft brace. The first step into this direction was the development of a soft brace called “Universal Spine Orthosis (USO)™” (patent pending) in 2007, which has not been applied widely. The harness for adjustment of the corrective ribbons provided using the soft brace as presented by Coillard[12–14] was replaced by a small plastic fixation element where the elastic ribbons can be adjusted to. This fixation element is adjusted to augment lumbar lordosis (Figure2). 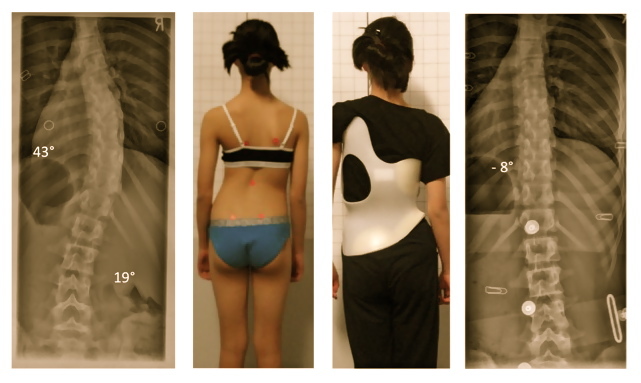 The USO™ allows to adjust the corrective ribbons in multiple ways for different purposes and therefore can be used for other indications than scoliosis treatment as well. However the USO, like other softbraces in use today[12–14] is not easy to adjust and also with this softbrace the patients may experience some problems in everday use (eg. clothes change, toilet use). Therefore we found further developments necessary to (1) make the brace easier to adjust, (2) easier to use and (3) to implement the corrective movements necessary in 3D. 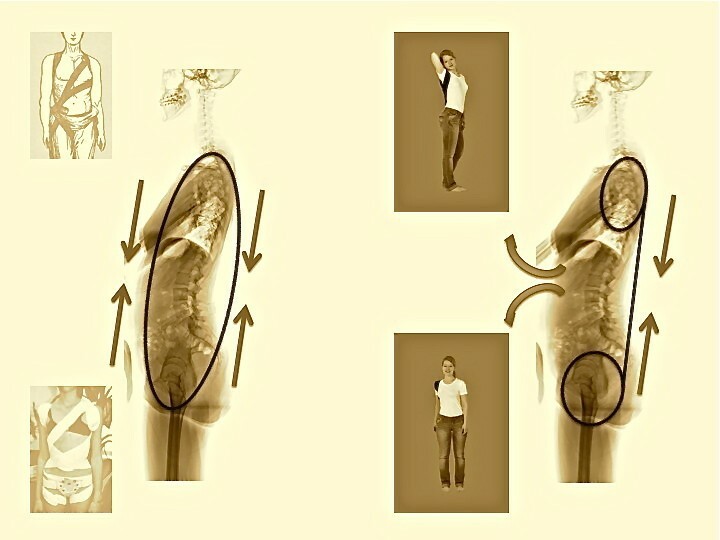 Within the Scoliologic™ ‘Best Practice’ program of physiotherapy we have a simple 3D system of postural corrections. This consists of (1) pelvic girdle correction, (2) shifting of shoulder girdle against pelvic girdle, (3) spiral shoulder girdle correction and (4) correction of the sagittal profile[21, 22]. These are also the main principles of correction we find in the Scoliologic™ ‘Best Practice’ hard braces (Chêneau light™, Gensingen brace™) leading to high in-brace corrections (Figure3 and4) as has been documented recently[22–24]. The application of the Scoliologic™ ‘Best Practice’ braces has been shown to have the least rate of surgery, when compared to other studies respecting the SRS inclusion criteria. Corrective movement during a ‘Power Schroth’ exercise. (With kind permission by Pflaum, Munich). Therefore it was the aim of our recent development to implement all these principles of correction and by the same time make the new soft brace development smaller and more easy to adjust. The result of this development is demonstrated in the following. Contrary to the correcting ribbon material as used in the soft brace as presented by Coillard[12–14] we apply materials with much less elasticity (Figure5). In principle the materials we use are of endelastic entity and do not lose the tension force after a few weeks time of wearing. The correction as adjusted can be maintained, however as there is no unlimited freedom of movement like in the soft brace as presented by Coillard[12–14], this brace is not as comfortable to wear. However less comfort is outwighted by a constant force of correction leading to the best possible results as achievable with soft braces considering that correction in brace treatment is crucial to the outcome[9, 26]. Aspects of the Spinealite™ soft brace attached for a 3CL pattern according to the ALS classification. The adjustment of the Spinealite™ is pattern dependent (Figure6). 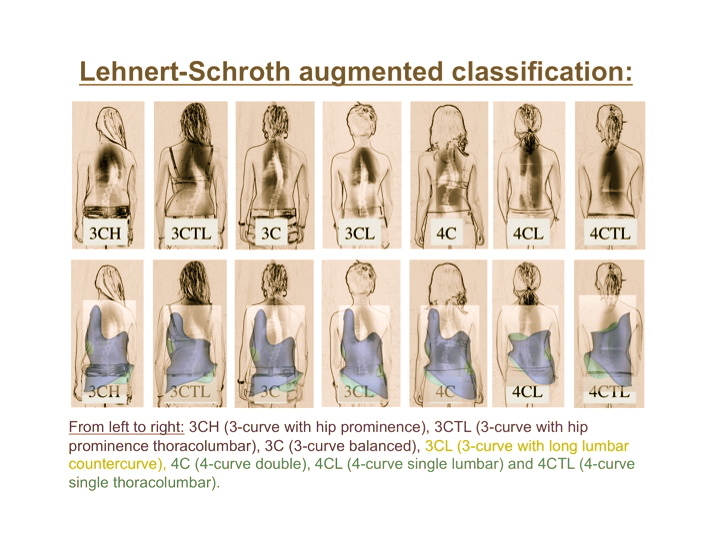 We derive the adjustment of the system from the ALS Classification (Augmented Lehnert-Schroth Classification). The shift is adjusted for all curvature patterns containing a thoracic curvature (3CH, 3CN, 3CTL, 3CL, 4C). In these cases the shoulder girdle is retracted on the thoracic convex side and shifted over to the thoracic concave side. In patterns without a significant lumbar curve (3CH, 3CN, 3CTL) the pelvic attachment is made more central, in patterns containing a significant lumbar curve (3CL,4C, 4CL, 4CTL) the attachment to the pelvic part of the system has to be made more lateral in order to allow a lifting of the hemipelvis on the side of the lumbar convexity (Additional file2). The ALS classification. (With kind permission by Pflaum, Munich). The adjustment is described in more detail in the accompanying product description. A 12.6 year old girl from Russia presented in the practice of the senior author for brace treatment. 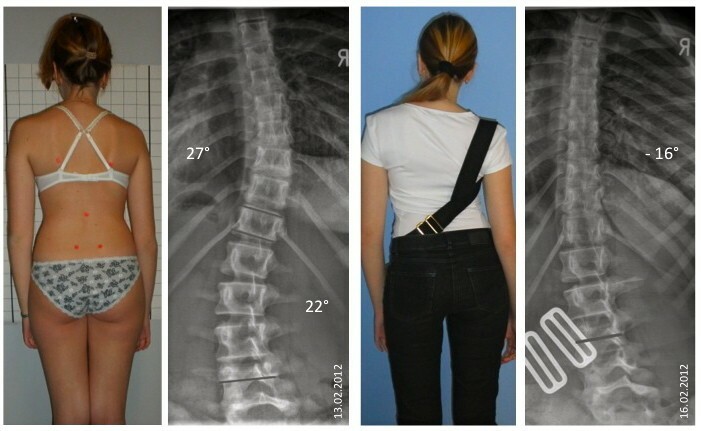 The girl was 2 months postmenarchial with a Cobb angle of 28° thoracic and 22° lumbar in summer 2011 when she was treated with a Chêneau brace for the first time (Angle of Trunk Rotation [ATR] thoracic 8°, lumbar 3°). The in-brace correction in the 1st. brace for a double curve pattern was fairly good to 10° thoracic and 11° lumbar (Figure7). After 6 months she had outgrown the first brace and returned for a second brace. The curve has been stable with 27° thoracic and 22° lumbar. As at the time of the last presentation the clinical pattern tended more to a single thoracic pattern (Angle of Trunk Rotation [ATR] thoracic 7°, lumbar 0°) it was decided to treat the girl with a 3CN type of brace from the Gensingen library. The patient presented in the case report in her 1st. Gensingen brace™. A 3CL Gensingen brace™ was adjusted leading to an acceptable correction. The initial angle of curvature was 28° and in brace correction was 10°. As the patient reported some problems with compliance in hard braces it was decided to offer the Spinealite™ soft brace additionally so she could change braces wearing the Spinealite™ for 12 hrs. over daytime and the Gensingen brace™ for 12 hrs. in the evenings and at night. Both braces were able to overcorrect the main thoracic curvature to −16° (Figure8 and Figure9). However the patient felt comfortable in the hard brace without any pains and uncomfortable in the soft brace when full correction was applied. So for the start we reduced the correction to a comfortable position and asked the parents to increase the correction every week as the ribbons can be easily be readjusted at home. The patient presented in the case report in her 2nd. Gensingen brace™. A 3CN Gensingen brace™ was adjusted leading to an overcorrection. The initial angle of curvature was 27° and in brace correction was −16°. The little amount the apical vertebra is rotated shows a high flexibility of the curve. Nevertheless, an overcorrection has only been achieved when the correction was changed to single curve correction without addressing the lumbar curve. The patient presented in the case report in her Spinealite™ soft brace. Spinealite™ soft brace was adjusted leading to an overcorrection. The initial angle of curvature was 27° and in brace correction was −16°. The lumbar counter curve in frontal plane does not seem to be corrected much, however the axial load of this system when applied to the maximum correction obviously leads to an increased rotation. Therefore we would not allow the use of this system alone without hard brace and we will always propose regular clinical controls. A video showing the adjustment of correction in this new soft brace is available. There is a small body of evidence for the use of soft braces in the treatment of scoliosis[12–17, 27–44]. Contradictory results have been published for samples treated during the pubertal growth spurt[15–17, 30, 32, 34]. In a biomechanical analysis the reason for the lack of effectiveness during this period has been elaborated. Improved materials and the implementation of corrective movements respecting also the sagittal correction of the scoliotic curve will contribute to an improvement of the results achievable (Figure5 and9). At this moment we apply the new soft brace system (Spinealite™) together with high corrective hard braces, 12 hrs. each, however with increasing numbers of patients and increased experience we do hope to offer this new soft brace as the sole form of treatment for adolescents during growth in the near future. Although there is a small body of papers on soft brace treatment as found in literature[12–17, 27–44] we would not expose our patients to the risk of sole softbrace treatment as some of the papers reveal contradictory outcomes[15–17, 30, 32, 34] and restrictions to use certain types of braces with respect to curve patterns. At this stage there is no evidence that the Spinealite™ can improve the outcome of soft bracing, however the principle of applying corrective movements as described by Fischer and later by Coillard[12–14] has been found to be beneficial to some extent. The trunk shift in combination with the other 3D corrective movements is a powerful corrective force as can be seen on Figure4. The addition of a sagittal corrective movement theoretically should enable to improve the outcome of soft bracing additionally[18–20], but this finally has to be proven in future studies. This new soft brace has been shown to be able to correct a scoliosis to an extent comparable to high corrective hard braces. Therefore we expect beneficial outcomes when the brace can be worn as prescribed[9, 26]. In principle the Fischer brace, SpineCor and the Spinealite are using a certain corrective movement mainly derived from physical therapy approaches, while the only other soft brace on the market today, the TriaC is using the standard three-point system and can only be applied for certain single curves. The Spinealite, contrary to the Fischer brace and the SpineCor, only uses one dorsal compressive force (Figure10), allowing a lordosation of the trunk in the middle between the two attachment areas (Shoulder and thigh), which is at the thoracolumbar junction / high lumbar region. This corrective movement in sagittal plane has been shown to be beneficial for curve correction. 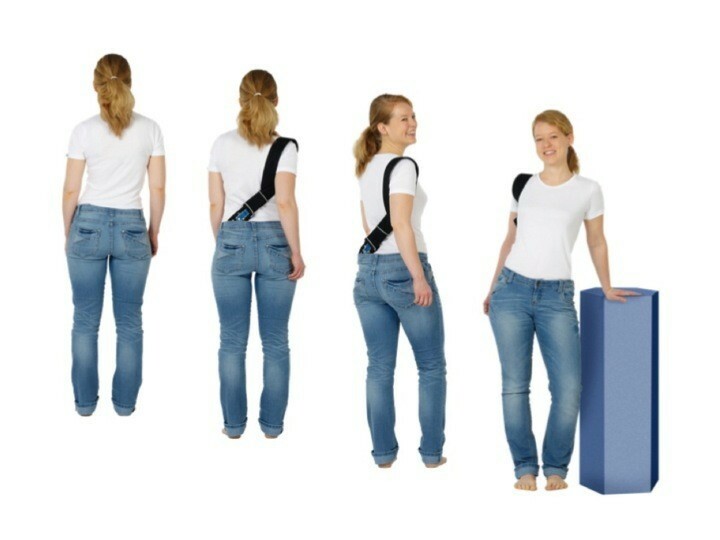 Additionally, the materials used are less elastic than in the SpineCor preventing free mobility (also into the deformity), but this exactly may be viewed as the difference between a corrective brace and a t-shirt. Simplified model of the trunk compression as applied in soft braces using the corrective movement principle. While in the Fischer brace and in the SpineCor ventral and dorsal compression forces are applied, the Spinealite only uses one dorsal compressive force (Figure10), allowing a lordosation of the trunk in the middle between the two attachment areas (Shoulder and thigh), which is at the thoracolumbar junction / high lumbar region. The full correction as possible should not be applied from the very start. A slight corrective movement should be visible in frontal and sagittal plane which can be increased every week. The application of this new system, however requires an experienced clinician able to distinguish between the different curve patterns of the ALS classification used for a proper adjustment of both, hard- and soft brace. The Spinealite™ soft brace / biofeedback device is using certain corrective movements which have been described earlier on[21, 22, 48–51], however, according to a recent review it should be emphasized that the power of exercises should not be overestimated, see Figure six from that article. Nevertheless, we propose to perform the Scoliologic™ ‘Best Practice’ program as described by Borysov and Borysov extensively. The treatment of scoliosis using soft braces is supported by some papers providing a small body of evidence. During the growth spurt the use of soft braces is discussed contradictory. There are shortcomings with respect to limitations of indication. There is insufficient evidence to draw definite conclusions about effectiveness and safety of the intervention (soft brace treatment). Written informed consent was attained by the patients and parents to permit the publication of the clinical pictures. A retraction note to this article can be found online at http://dx.doi.org/10.1186/1748-7161-8-7. An erratum to this article is available at http://dx.doi.org/10.1186/1748-7161-8-7. I wish to thank Pflaum Company for permitting the publication of pictures taken or modified from the book with the title Weiss HR: Best practice in conservative scoliosis care. 4th edition 2012. HRW is advisor of Koob-Scolitech, Abtweiler, Germany and has applied for patents. HRW: Review of the data base, hand review, manuscript writing, patient acquisition. MW: Patient acquisition, technical support, prototype production according to the adjustment plan, brace / biofeedback device adjustment to the patient. All authors read and approved the final manuscript.